I specifically chose NOT to select one word as a theme for this year. I’m terrible at following through with things. And yet one message keeps sticking with me regarding my writing and ministry (if you want to call it that)—generosity. I cannot only promote myself. I can’t do things that are simply to further my own brand. So much of the writing business is about tooting your own horn and staying in front of your readers. I feel uncomfortable every time I do that, and yet I keep trying because I feel like that’s what I’m “supposed” to do. However, in a Bible study a few months ago, I was introduced to the concept that we don’t need to keep coming up with new plans, asking God to bless them. We need to watch and see where God is already working—and then get on board. Do you realize how many amazing ministries there are out there? Some causes are close to my heart; others are new to me. Some people have far-reaching audiences and some have no more than a handful of friends. And yet the love behind each of their efforts is genuine and enthusiastic and passionate. I’d be honored to work with these women (not meaning to generalize, but all of the entries came from women) to reach new people—to help people focus their thoughts and pray, whatever the particular circumstances. To give them hope to hold onto, no matter what is going on. Almost immediately after I announced this contest, I felt such regret. Not because I had second thoughts about designing a calendar for someone else, but because HOW ON EARTH CAN I DECIDE?! I received SO MANY amazing ideas. Well over 30 of them, most well thought out and intriguing. I’ve read them again and again, printed them out, thought and planned and made spread sheets and prayed. But I couldn’t make a decision. Until I realized that the only person limiting me to just one winner was me. This is my blog… this is my contest… and I can do what I want :-). The winner of the prayer calendar for March is, well, two people. It’s sort of a combination of the ideas entered by Michelle Nietert and Dr. Michelle Bengtson. I’d love to have a prayer prompt calendar centered around some of the themes in my book, Hope Prevails: Insights From a Doctor’s Personal Journey Through Depression. Prompts could include (but not limited to) praying for those who are currently struggling in the valley of depression, as well as prompts that coincide with the chapters in the book: recovering our joy, reclaiming our peace, re-establishing our identity, knowing our worth in Him, remembering our secure destiny, being confident that nothing separates us from His love, being thankful that God uses our pain, etc. Michelle Nietert brought my attention to the appropriateness of the timing, but I’ve been wanting to read Michelle Bengtson’s Hope Prevails, so I’m kind of merging the two entries into one calendar. I plan to pull many of the prompts from ideas in the book. I’m excited to bring this to you next month, particularly because in this part of the country, March can be pretty blah. And we can all, always, use some hope. But then again, why stop there?! In May, I’m teaming up with Sarah Philpott for a topic I feel passionate about—a movement to honor all women on Mother’s Day. I haven’t miscarried or lost a child or had fertility issues, but I have lost my mom, and it made me realize how many people experience mixed emotions while the rest of the world is celebrating mothers during that whole month. In October or November, I’m planning to do a calendar based around the themes of a new novel—historical fiction about the Oklahoma Land Rush—being released by Jayme Mansfield. I think it will be a fun challenge to create a calendar around ideas in a novel. I picked this simply because I thought it would be fun. And all those other months? Well, you just never know. So if you aren’t mentioned here, that doesn’t necessarily mean you won’t hear from me later! Honestly, the only thing keeping me from promising to pick one a month for the next year is the fact that, while I love to plan, I’m terrible at follow-through. I don’t want to overcommit and then disappoint people (and myself). Not to mention the fact that I need to leave some room for creativity—whatever floats my boat at that particular time. I like to leave some room for inspiration and whimsy. While writing this post, in fact, I came up with yet another idea I am dying to do for April! 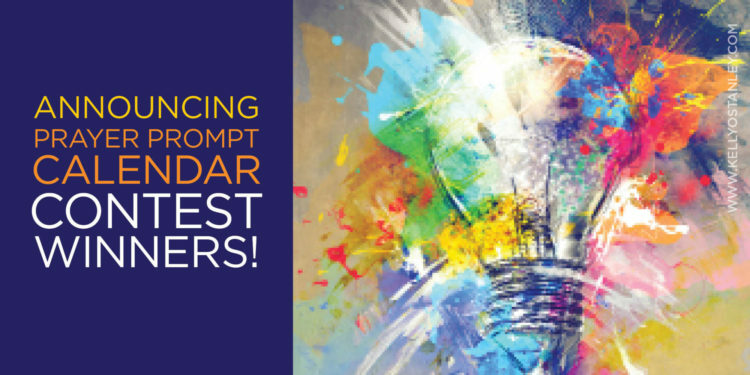 Please know that if I move forward with any of your ideas, I will give you credit, link to your blog (if you have one), and seek your input as I create the calendar. So, to all of you who entered, I want to say thank you. Besides inspiring me in general, your suggestions also inspired me to branch out. Many of the ideas submitted were important but not necessarily universal needs—things like pregnancy loss, being in the sandwich generation, facing cancer, dealing with grief, and so on. A few months ago I created a calendar for Laura Polk, who writes for Christian single moms. (If you’d like to know how to pray for a single mom (or if you’re one), click on over here to sign up for her newsletter and get your copy of it for free.) 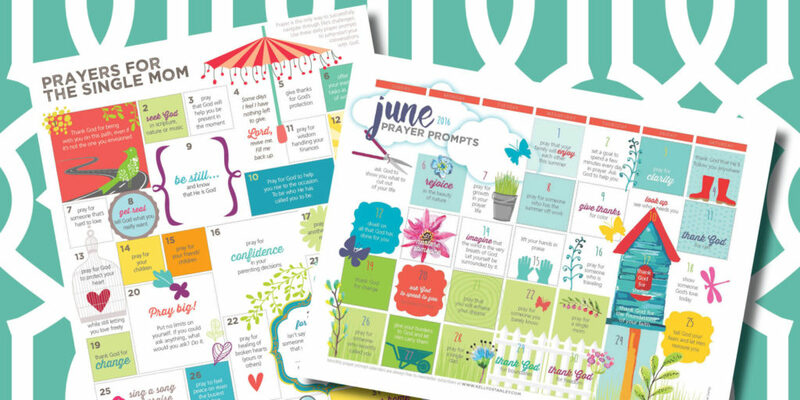 As I read the contest entries, I decided to expand on that idea and develop a series of undated “30 days of prayer for ___” calendars to make available for people whenever they’re facing a specific situation. I plan to slowly add to my downloads page with more of these as I can find the time. In a few weeks, I’ll send the new hope-themed calendar to my newsletter subscribers, so if you’re not already signed up, now would be a good time. (Click here and then subscribe in the purple box in the upper right part of the page. The teal colored “never miss a post” box on the blog page subscribes you to blog posts but not my monthly newsletter.) 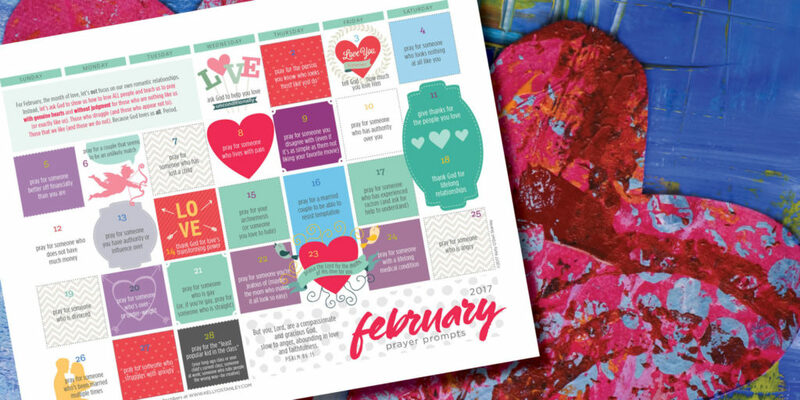 When you sign up, you’ll have access to the February calendar right away. Thank you all for the excitement surrounding these calendars, for your passion for the people you’re connected with, and for your belief that prayer matters! This is wonderful! Can’t wait to see them!